Previously in this series, we've talked about using Eyefinity with older displays and how to find the right adapter for non-DisplayPort monitors. Okay, we've established that you want Eyefinity for multi-display CAD operations, and the display manufacturers and graphic card manufacturers aren't necessarily making it easy for you. Eyefinity drives 3 or more displays simultaneously. 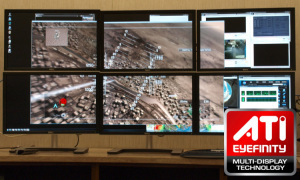 Eyefinity lets you drive 3 or more independent displays simultaneously from a single low-power FirePro graphics card. This technology is great for CAD users because it enables you to multi-task different workflow applications on each display or span a single CAD application across multiple displays as one desktop workspace. Check out this video showing using a three-display configuration driven by a single laptop and then tell me you don’t want it. But while the graphics card manufacturers embraced DisplayPort early on, the display manufacturers (Apple aside) have only recently made the switch. Beginning in 2010, Asus, Dell, HP LaCie, Lenovo, and NEC released more than 80 displays supporting DisplayPort. But there are still a lot more displays released with only the less expensive DVI or VGA input connectors. So What Do I Do with My Older Monitors? Can I Still Use Eyefinity? 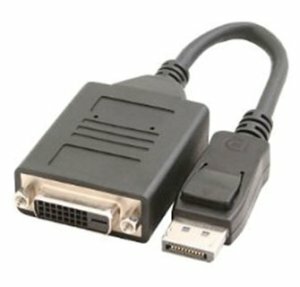 So what do you do if you have a display/monitor released before 2010 that only has single-link or dual-link DVI inputs? Or perhaps more interestingly, what if you want to set up a 3- or 4-display visual workspace for your CAD workflow using Eyefinity, but some or all of the displays you plan to use only have DVI/HDMI/VGA inputs? Next, I'll talk about DisplayPort adapters that can help you do just that.